Pitch, Hit & Run Event! Home / Pitch, Hit & Run Event! Come Enjoy an Exciting Baseball/Softball Skills Competition! Ages 7-14 encouraged to come and showcase their pitching, hitting and running abilities! 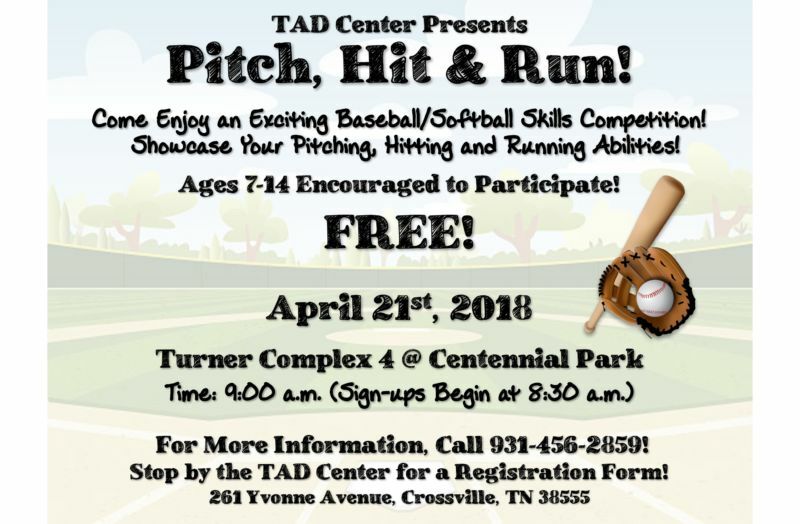 FREE Event at Turner Complex 4 at Centennial Park in Crossville. Sign-ups begin at 8:30 a.m. Contact us for more information: 931-456-2859 or stop by the TAD Center for a Registration Form! © TAD Center. All rights reserved.